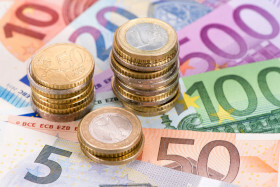 The euro today fell to new weekly lows in the early European session following the release of weak PMI prints from across the eurozone by IHS Markit. The single currency later rebounded following the announcement of the European Central Bank’s monetary policy decision and a balanced speech by the ECB Governor. The EUR/USD currency pair today fell from an opening high of 1.1392 to a low of 1.1305 before rebounding shortly thereafter. The currency pair today headed lower from the late Asian session amid a risk averse market sentiment as investors faced numerous global risks. The eurozone services PMI, which came in at 50.8 versus the expected 51.5, drove the pair lower as did the manufacturing PMI, which was recorded at 50.5 versus the expected 51.4. The announcement of the ECB Governing Council‘s monetary policy decision in the mid-European session triggered a rebound by the pair. The ECB left its bank rate decision at 0.00%, while the marginal lending facility was maintained at 0.25% and the deposit rate was retained at -0.40%. The pair’s recovery was further boosted by Mario Draghi‘s speech, which highlighted economic risks before turning slightly hawkish. The pair later headed lower after the release of the US initial jobless claims data, which came in at 199,000, a level last recorded in 1969. The release of preliminary Markit US manufacturing and services PMIs also surprisingly beat expectations triggering a massive decline by the pair. The currency pair’s future performance is likely to be driven by geopolitical events and tomorrow’s German IFO data. The EUR/USD currency pair was trading at 1.1297 as at 18:05 GMT having dropped from a high of 1.1392. The EUR/JPY currency pair was trading at 123.88 having fallen from a high of 124.90.